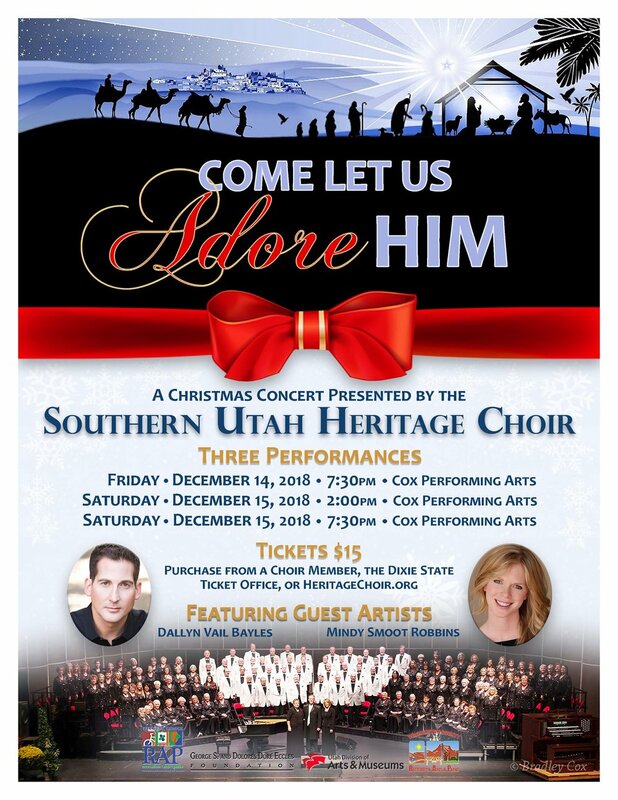 The Southern Utah Heritage Choir under the direction of principle conductor Dr. Ken Peterson, new associate conductor Kathy Brown, pianist and artistic director Tami Creamer, and organist Karen Lee Kennedy, will present three performances of its Christmas Concert, Come Let Us Adore Him, featuring recording artists Dallyn Vail Bayles and Mindy Smoot Robbins on Friday and Saturday, December 14thand 15th in the Cox Auditorium on the Dixie State University campus. Mindy Smoot Robbins just concluded the most recent Tuacahn season, playing the role of Miss Honey in the musical Matilda. Mindy has performed for local audiences for more than a decade at Tuacahn and also worked as the understudy for Broadway star Sutton Foster in the role of Eponine for the touring production of Les Miserables. Dallyn Vail Bayles has a lengthy resume as well, having worked as a professional singer and musician for years. His numerous credits include the role of Enjolras in the Broadway tour of Les Miserables and as a featured soloist with the Tabernacle Choir. Both evening performances begin at 7:30 pm with a 2:00 pm matinee on Saturday. Admission is $15. Tickets are available from the DSU ticket office, online at dsutix.com or directly from choir members.